Adam Sherriff Scott was born in Perth, Scotland in 1887. He studied art at the Edinburgh School of Art and immigrated to Canada in 1911 or 1912. He died in Montreal, Quebec in 1980. He was a portrait painter as well as a landscape artist, but is best-known for his series of historical paintings of Canada, which he executed for Canadian Pacific, Royal Bank, and for the Public Archives of Canada. 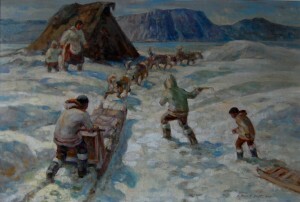 He produced oil paintings about Champlain and painted self-portraits and Inuit portraits. He also received a commission for the Royal Bank of Canada in commemoration of the centenary of transatlantic steam navigation. Adam Sherriff Scott produced paintings, prints, engraving, lithograph and watercolours. The painter, watercolourist, draughtsman, printmaker, Marc-Aurele Fortin was born in Ste-Rose, Quebec, once a suburban village north of Montreal, and for his entire life, he was devoted to landscape painting that celebrated the beauty of nature. Even when depicting the port or suburbs of Montreal, such as Pont-Viau, he focused on the bucolic aspects of regions not yet encroached by modern urbanism and remained faithful to the role of the artist as a celebrator of nature’s beauty. “Painting”, he said, “is silent poetry”. He studied with Edmond Dyonnet at the Council of Arts and Manufactures in Montreal by 1907 and with Edward J. Timmons at the Art Institute of Chicago by 1910. He lived in Edmonton in 1907-09, Chicago, New York and Boston in 1909-12. He travelled in France 1934-35.Marc-Aurele Fortin died in Macamic in 1970. 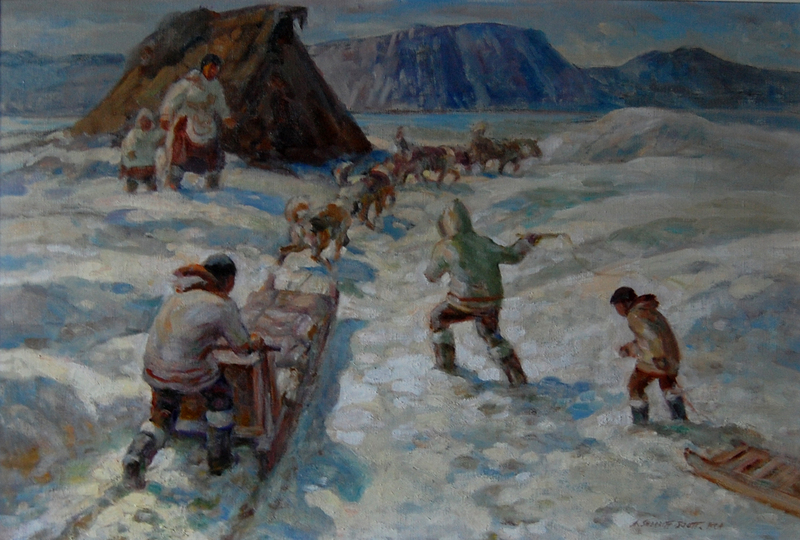 He painted in the Laurentians, Quebec City and vicinity, Île d’Orléans, Charlevoix, Gaspé and Saguenay regions. Subsequent to his 1935 trip to Europe, Marc-Aurèle Fortin began to experiment with his manière noire, or black manner, whereby he covered the entire surface of his canvas or board with black enamel. Once it was dry, he deposited colour directly from the tube and then later extended these applications with a brush, achieving an intense luminosity and brilliance of colour. Fernand Toupin was born in 1930, Montreal, Quebec, his first studied drawing at the Mont St-Louis in Montreal. In 1949, he enters the night classes at the Ecole des Beaux-Arts de Montreal. 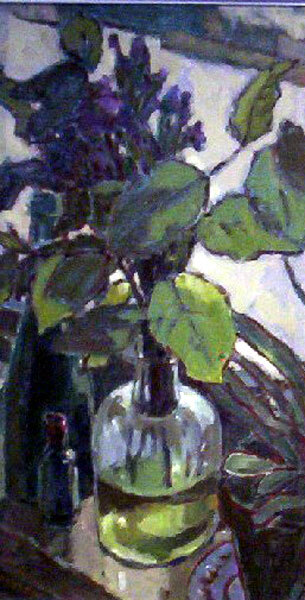 He then studied under Jean-Paul Jérôme from 1949 to 1953 while also frequenting Stanley Cosgrove’s studio. Not being able to live off his art and having a family to feed, he worked at the Municipal Court of the City of Montreal. In February of 1955, Jean-Paul Jérôme, Louis Belzile, Jauran (Rodolphe de Repentigny, Art critic and artist) and Fernand Toupin lauched the “Manifeste des Plasticiens” during a show held in Montreal. In this they advocated a pure strain in painting. They declared that their ultimate goal was “unity in painting, pure order with no incidentals, and a spontaneous expression of the subconscious”. Their paintings resolved themselves into coloured geometric shapes, eliminating such aspects as suggestion of visible space and ultimately textural effects. At that time Toupin painted his geometrical forms on irregular canvases or what they called shapped canvases. In 1957, Toupin became Director of exhibitions at the Conseil Exécutif de l’Association des Artistes Non-Figuratifs de Montréal, position that he would hold for two years. He had already been part of the group since 1956 and had exhibited with them at different places including The Montreal Museum of Fine Arts. He kept working for the City of Montreal and painted on his free time. In the late ‘50s and early ‘60s, he slowly gave up the geometrical and slick painting recipes and started experimenting with a more lyrical and textured works. He exhibited in many solo exhibitions in galleries and also participated to different group exhibitions including “Montréal Collectionne” exhibition (1966) held at the Montreal Museum of Fine Arts, the “Canadian Art” travelling exhibition (1966) held in nine Canadian Museums and also the “Panorama de la Peinture au Québec, 1940-1966” exhibition (1967) at the Musée d’Art Contemporain de Montréal. In the beginning of 1970, he was offered a solo exhibition in a Paris gallery and had a sold-out show. From then on he was taken under the care of a Montreal art dealer who flooded Toupin with work and shows. 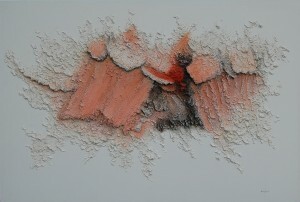 This enabled him to leave his job at the City of Montreal and concentrate on painting and exhibiting in Canada, the United-States and France while participating at different shows all over the world in the next decades; Osaka World fair in 1970; IVe Festival Internationnal de Peinture in Cagnes-sur-Mer, France (Winner of the International Prize for Canada); “Jauran et les Premiers Plasticiens” exhibition at the Musée d’Art Contemporain de Montréal in 1977; Art Expo International in New-York in 1980; Tokyo Central Museum in 1990 and many other exhibitions in different Canadian Museums and galleries. During the ‘70s he illustrated books and also helped create decors for different shows at the Grands Ballets Canadien in Montreal. He was elected a member of the Royal Canadian Academy in 1977. He died at the age of 78. Albert Rousseau was born in 1908 in St. Eitenne-de-Lauzon. His art career begins with attending the School of Fine Arts, from which he graduated in 1931. He had plans of becoming an independent artist but the Great Depression hit and the artist himself was forced to work. He continued to paint through this time period and beyond it. 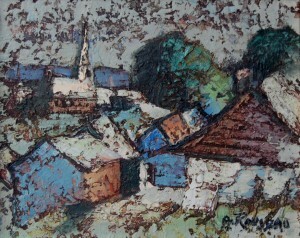 In 1956 he built a studio for himself and his colleagues to paint at. 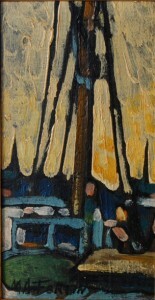 In 1960 Rousseau began to teach at various institutions in Quebec. He was known, during that time, for organizing a rural exhibition that ran annually, which other local artists have continued on with in his memory. In 1970 Rousseau purchased a mill which he had renovated in to a gallery setting and a place for artists to meet. It was known as Le Moulin des Arts and to this day artists still gather and show work in. It is also the sight of his annual show. He is one of the forefathers of art in Canada. He had dedicated his life to it. Rousseau had traveled frequently and found it a stimulating source of his work. He would sketch during his travels work and then upon his return would return to his studio to create paintings from his sketches. Known best for his Impressionistic style of painting, it is one from which many other artists have used as inspiration for creating their own style. He was inspiring to and inclusive in the art world until his death in 1982. Rousseau’s pieces still on display portray the memories of a life in art well lived. Helmut Gransow was born in 1921 in Germany died in 2012 in Montreal. He trained as a painter with Max Kraus at the Academy of Fine Arts in Berlin, and studied design and painting at Stuttgart’s Werkschule Merz, and the Academy of Fine Arts in Karlsruhe, where his professors include Wilhelm Schnarrenberger and Otto Leible. Helmut Gransow was born in 1921 in Germany. He trained as a painter with Max Kraus at the Academy of Fine Arts in Berlin, and studied design and painting at Stuttgart’s Werkschule Merz, and the Academy of Fine Arts in Karlsruhe, where his professors include Wilhelm Schnarrenberger and Otto Leible. In 1949, Gransow emigrates to Canada, and settles the following year in the Laurentians, where his still lives and continues to create. Gransow has traveled extensively and painted in Canada, the U.S.A., Mexico, Germany, France, Yugoslavia, Portugal and Nigeria. Gransow received the painting award of the Québec Exposition Provinciale (1958), the Art Gallery of Hamilton Purchase Award and an Honorable Mention at the Fourth Winnipeg show (1959). He also became a member elect of the Society of Canadian Painters, etchers and Engravers (C.P.E.) in 1955, the Canadian Society of Graphic Arts (S.G.A.) 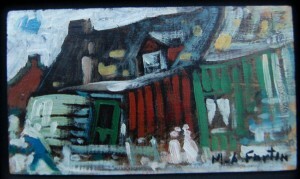 in 1961, and the Royal Canadian Academy of Arts (R.C.A.) in 1983. 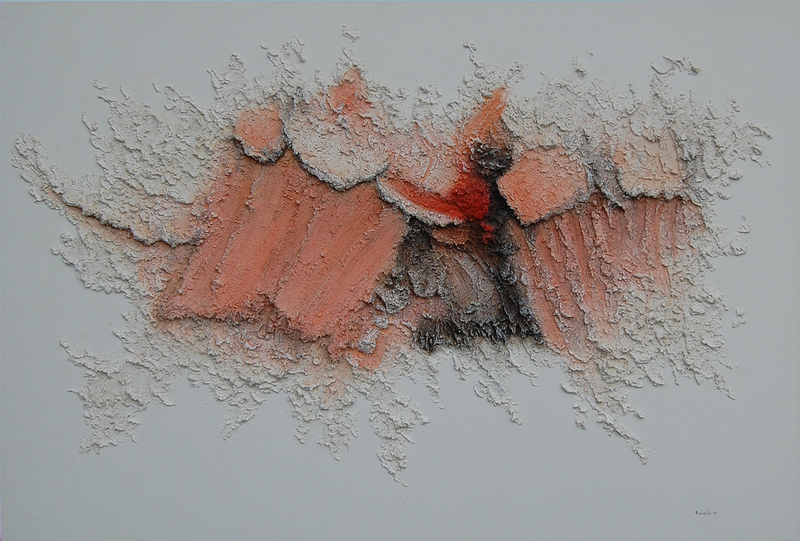 Gransow worked with Aquarelle, Acrylic, Monotype, Serigraphy, Lithography, Oil, and Pastels.